Quiche is the perfect weekend meal. Really, no more of this “real men don’t eat quiche” crap. If you’re a real man, you’ll eat whatever the heck you want. A) Add whatever you have left over in the fridge from the week: Leftover vegetables, last night’s ham, that cheese that’s almost to the point of no return. The possibilities are endless. B) You can make it, and then eat the leftovers the rest of the weekend, provided you don’t have a bunch of hungry munchkins to feed the first time. 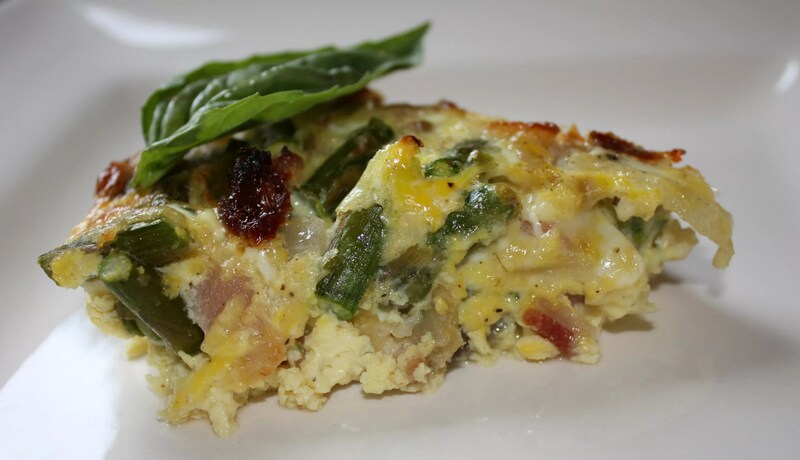 C) Quiche can be eaten any time of day. It’s perfect for breakfast, brunch, lunch or dinner. What else is that versatile? I love quiches that are loaded with ingredients. None of this skimpy on filling, heavy on the egg crap. So what did I have in the good ol’ icebox at the end of this week? 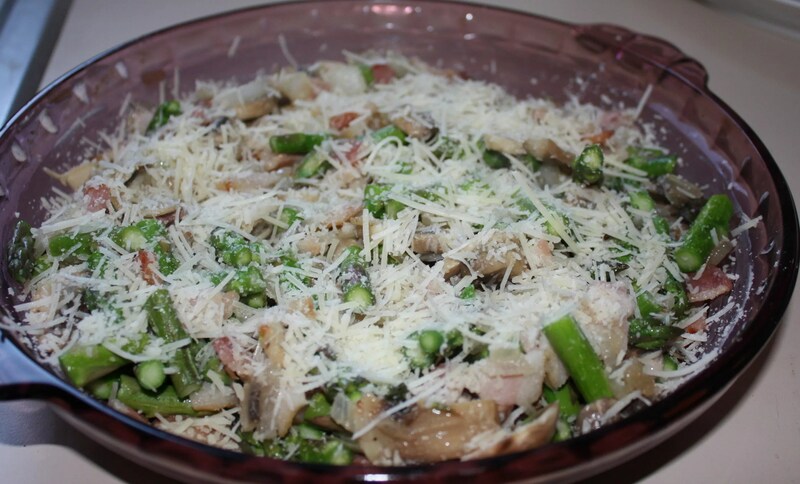 Bacon, asparagus, mushrooms, and sun dried tomatoes. Sounds like quiche time to me. I may be crazy, but I like my quiche crustless. That’s right. No crust. I’m not a huge fan of pie crust in general, but I see the need in something like a fruit pie. Without the crust, you’d have fruit soup. But for quiche, the egg and cheese forms its own crust. Not to mention it’s healthier. If you wanted to get crazy healthy, leave out all or half of the egg yolks and replace with egg whites. Butter a quiche pan or pie pan and set aside. Start by placing cubed bacon slices in a cold frying pan. Turn heat to medium and cook, until just browning and most of the fat has rendered out. Add the mushrooms, and cook until they have shrank in size and have just started to brown. 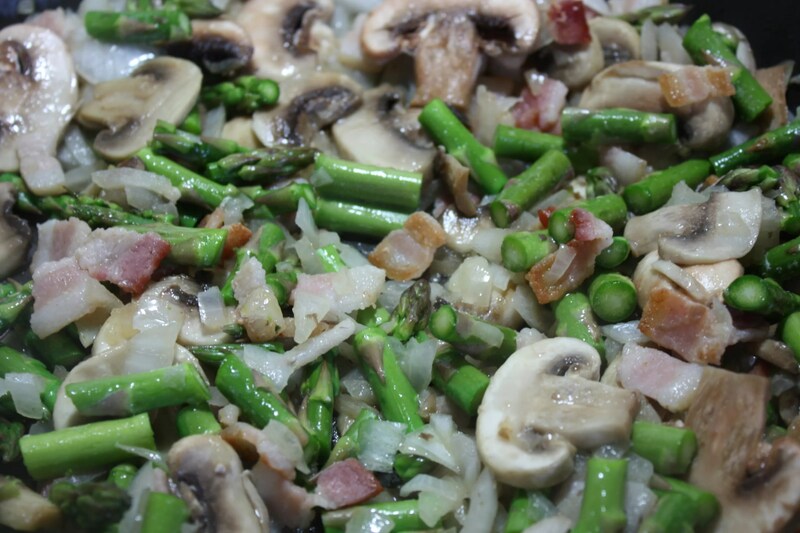 Add the asparagus and cook for three minutes, or until the asparagus just begins to soften. Set mixture aside. Whisk together eggs, milk and salt and pepper in a medium bowl. Pour the bacon and vegetable mixture evenly in the bottom of the pie pan. 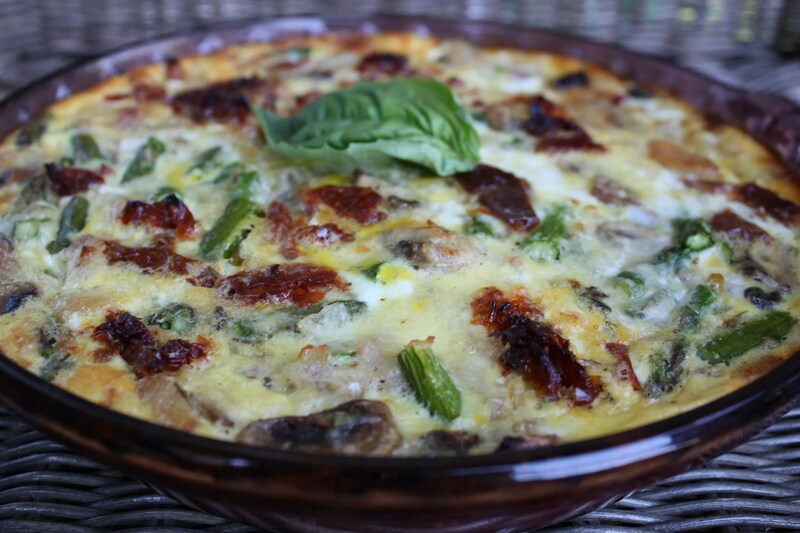 Top with the chopped sun-dried tomatoes and cheese. Evenly pour the egg mixture over the vegetables. Bake for approximately 45 minutes, or until the top has begun to brown, it does not jiggle in the middle and a knife comes out clean when inserted in the middle. As I said before, you can add anything to your quiche. The combinations really are endless. Just add what you love to eat! The way I butter my pans is by taking a stick of butter with one end of the wrapper removed and just rub the butter all over the surface of the pan. This is just one method. If you like a crust, you can either make your own or buy a pre-made pie crust. Reduce the amount of ingredients and egg so that it will all fit in the crust. I love the picture of the final slice. It looks so yummy, Adrienne. I also like making them without crusts, more of a frittata……but I never thought of overfilling them, that really makes more sense. Have you ever tried using some of your old crusty bread in the mix?